The House Republican leadership had to pull a seemingly innocuous spending bill from the House floor on Thursday after it became mired in controversy over whether the National Park Service could allow the Confederate flag to be displayed in federal cemeteries. 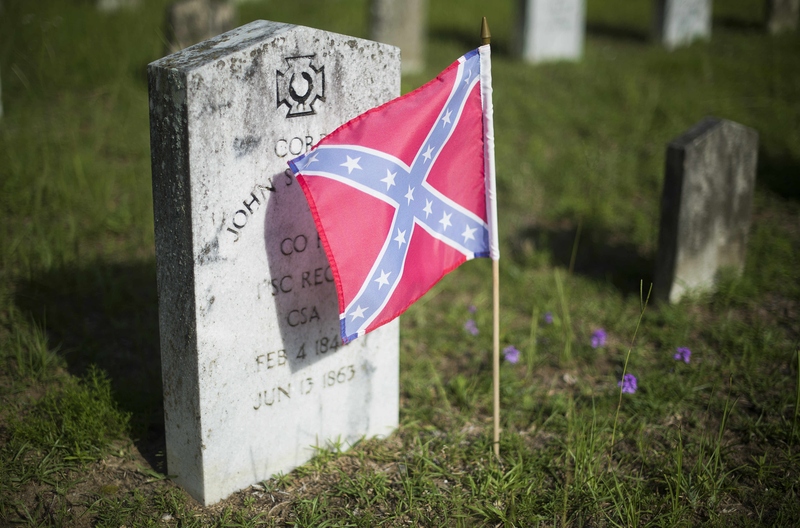 The controversy began Wednesday night after Rep. Ken Calvert, R-California, offered an amendment to the Interior Department spending bill, which would have ensured the Confederate flag could be displayed on the gravesites of Confederate soldiers buried in federal cemeteries. Just a day earlier, the House of Representatives agreed to ban the practice by adopting a Democratic amendment to do so, seemingly without objection. "This was an attempt to codify the Obama Administration's own directive to our national cemeteries and it is unfortunate that it has devolved into a political battle. It is our hope that we can have a thoughtful discussion on this matter that is free of politics," a GOP leadership aide said after the bill was pulled. During his weekly press conference on Thursday morning, House Speaker John Boehner, R-Ohio, said, "I want members on both sides of the aisle to sit down and have a conversation about how to deal with what has frankly become a very thorny issue." Asked whether he believed the Confederate flag should be displayed in federal cemeteries, Boehner said, "No." In a statement, Calvert said the amendment was brought to him by the House GOP leadership at the request of "some southern Members of the Republican caucus" in order to codify existing National Park Service policy set by the Obama administration that bans the sale and display of the Confederate flag on National Park Service properties -- except when it is in a historical or educational context. "To be clear, I wholeheartedly support the Park Service's prohibitions regarding the Confederate flag and the amendment did nothing to change these prohibitions," he said. "Looking back, I regret not conferring with my colleagues on the other side of the aisle, especially my Ranking Member Betty McCollum, prior to offering the Leadership's amendment and fully explaining its intent given the strong feelings Members of the House feel regarding this important and sensitive issue." McCollum, a Democratic congresswoman from Minnesota, was quick to criticize the amendment Wednesday night after Calvert introduced it. "After the murder of nine black parishioners, I never thought that the U.S. House of Representatives would join those who would want to see this flag flown," she said, in reference to the shooting at a black church in Charleston, South Carolina last month. "I strongly urge every member to stand with the citizens of all races and to remove this symbol of hatred from our National Park Service." She also called the amendment "shameful" in a tweet. GOP amendment just offered to lift ban on selling Confederate flags in National Parks. GOP support for symbol of racism&hate is shameful. Calvert's amendment, which he offered with little commentary, would ban funds from being used to prohibit the display of the U.S. flag, POW/MIA flag or "the decoration of graves with flags." The decoration refers to a an order the National Park Service (NPS) director adopted in 2010 that permits a sponsoring group to decorate the graves of Confederate veterans with small Confederate flags in states that celebrate a Confederate Memorial Day. The flags are supposed to be placed and removed as soon as possible after the day is over at no cost to the NPS. The amendment, Calvert says, would also codify a June 24 NPS memorandum that requests its third-party concessionaires to voluntarily stop selling items that show the Confederate flag as a standalone feature, especially on items like t-shirts that can be worn. The memo also said Confederate flags should not be flown inside National Park System sites, except where it would would provide historical context. Calvert's amendment would have reversed an amendment from Rep. Jared Huffman, D-California, that would ban NPS from allowing groups to place Confederate flags in federal cemeteries, no matter the circumstance. It had been adopted about a day earlier with seemingly no objection. The issue with that amendment, Calvert said in his statement, was that it did not maintain exceptions for displays in a historical and educational context. "The intent of the Leadership's amendment was to clear up any confusion and maintain the Obama administration's policies with respect to those historical and educational exceptions," he said. Calvert said that was not a problem with another amendment from Huffman that would have banned NPS from contracting with concessionaires who sell items depicting the Confederate flag, nor was it a problem with an amendment from Rep. Hakeem Jeffries, D-New York, that bans NPS from using federal funds to purchase or display the confederate flag, "with exception of specific circumstances where flags provide historical context." In the early hours of Thursday, the South Carolina House of Representatives approved a bill removing the Confederate flag from state Capitol Grounds after more than 13 hours of contentious debate. White House Press Secretary Josh Earnest compared the House Republicans to the South Carolina lawmakers in his briefing Thursday, saying the values of Republicans in Congress "lie elsewhere." "These are the same House Republicans who voted for a party leader who once described himself as once described himself as, 'David Duke without the baggage.' These are the same Congressional Republicans who have declined to criticize the race-baiting rhetoric of a leading Republican presidential candidate. That's to say nothing of the Senate Republican who saluted that candidate," Earnest said. "So when you hear me say that Congressional Republicans have an agenda that is out of step with the vast majority of Americans, this record, at least in part, is what I'm referring to."